SEC NetworkCollin Sexton wins it at the buzzer. The Alabama Crimson Tide survived to play another day after a thrilling game against Texas A&M in the SEC Tournament. 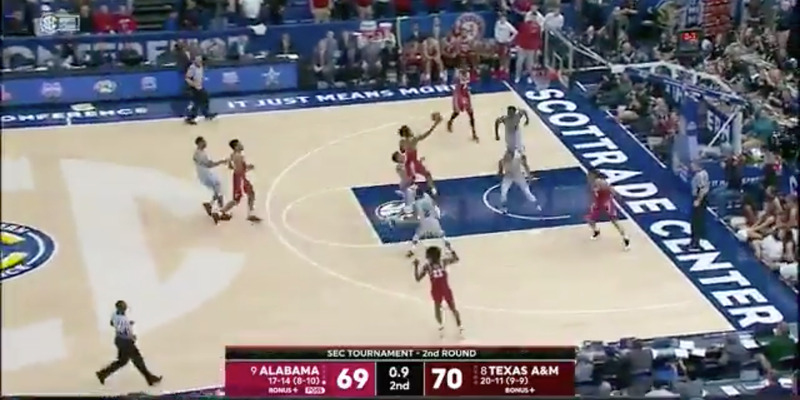 Alabama was trailing by one with just four seconds left in the game when guard Collin Sexton drove coast-to-coast to sink a scooping bucket just before the buzzer sounded. The win keeps the Tide’s March Madness hopes alive. Firmly on the bubble, Alabama will likely need one or two more wins to make it into the field of 68 on Selection Sunday. Conference tournaments can be filled with just as much drama as the March Madness brackets we all know and love. For many teams on the bubble, conference tournaments offer a final opportunity to prove that they belong in the field of 68. Alabama is one of those bubble teams. Finishing the regular season with a 17-14 record, they didn’t look quite like a tournament team, but with a slew of quality wins including a 5-2 record against ranked opponents, there was a case to be made for the Tide to go dancing should they make a run in the SEC Tournament. On Thursday, it looked like their March Madness hopes were dead in the water though, down 69-70 to the Texas A&M Aggies with just four seconds remaining. But on their final possession, Alabama guard and expected first round draft pick Collin Sexton stepped up for the Crimson Tide, going coast-to-coast to nail the go-ahead scooping bucket as the buzzer sounded. With the win, Alabama earns a trip to the quarterfinals against top-ranked Auburn, where the two will meet in an Iron Bowl of the basketball court. The Crimson Tide are currently solidly on the bubble, listed as one of Joe Lunardi’s “First Four Out” in his Bracketology predictions. With another impressive win or two, Sexton and company could sneak into the tournament as one of the final at-large bids – or if they can string three more wins together, they will take the SEC tournament outright and punch their ticket to go dancing without being at the whim of the selection committee. Selection Sunday isn’t here yet, but March Madness is already in full swing.